Hi there everyone!! With Christmas right around the corner it's time to make some Christmas cards!! Like A LOT of Christmas cards!! LOL I haven't gotten nearly enough ready to go yet so get ready for 2 months of Christmas projects from this girl!! LOL Today I got to work with Santa's List from QKR. It's such an adorable image that begged to be vintage style!! Beautiful card, Sara. 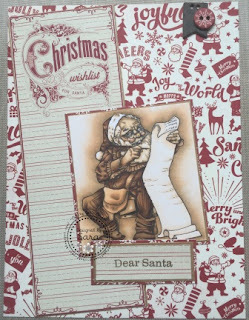 Love your colouring and the vintage look of this card.